Olubunmi Okunade had her future all mapped out. Having run track for most of her athletic life, it made total sense – at least in her mind – that she’d end up at an NCAA Division I school, far from her strict Nigerian parents, and blaze a path she could call her own. But little did Okunade – her friends call her “Bunmi” – know that one of her track teammates from middle school would influence not only what sport she’d play but where she’d end up playing it as well. 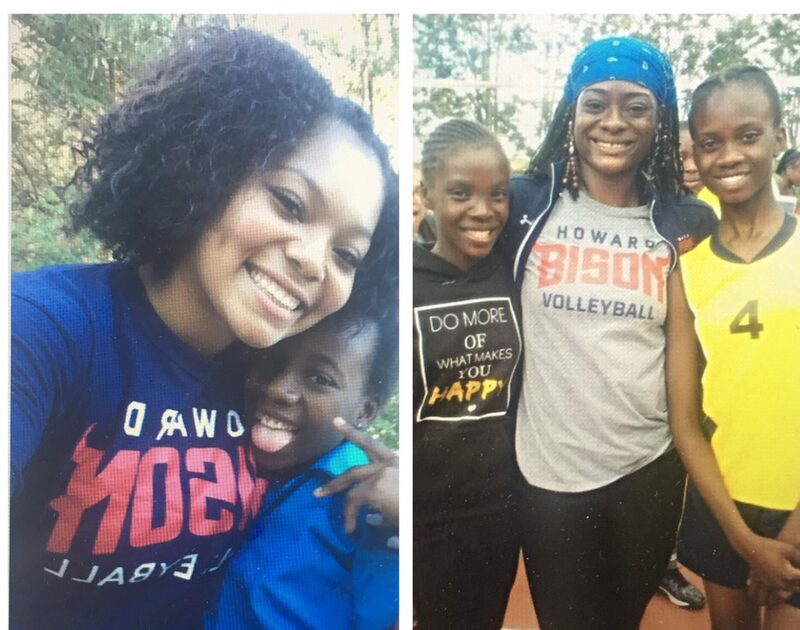 Okunade and that teammate, Tamia Dockery, have been two peas in a pod since forever; both enrolled at Howard University in August 2015, and have been an integral part of the women’s volleyball success the last three seasons. “I ran track for 12, nearly 13 years,” explained Okunade, a 21-year-old Nigerian American born in Houston. “Then in high school, a teammate who I’d known for a while invited me to come play volleyball with her on her club team, the Southwest Juniors. I said, ‘OK, let me go check it out.’ Any time me and Tamia played with each other, it was just like a dynamic duo. Nobody could stop us. It was so cool. My senior year, I just decided, ‘You know what? I’m going to play volleyball,’ ” said Okunade, a logistics and supply chain management major whose parents migrated separately to America in their 20s, met San Francisco, married in Nigeria and eventually settled in Houston. Strangely enough, Okunade thought her athletic career might be over after she tore her ACL while at a junior nationals event in Minnesota during her junior year of high school. But Dockery’s mom Treena would have none of that negative thinking and encouraged her to contact a slew of Division I volleyball coaches, including Howard’s head coach Shaun Kupferberg, about opportunities to play. After a visit to Washington, D.C., Okunade felt at home – immediately bonding with the team; that new path she had her mind set on had taken an unexpected turn for the better. The 2017-18 women’s volleyball team is coming off three consecutive NCAA appearances – with victories over Big Five schools – and the acclaim of having taken a set from high-powered and 30-1 Penn State in December 2017 in the NCAA tournament, a game Howard eventually lost 3 sets to 1. It was the first time Penn State had lost a set in the first round of the NCAA tournament. “I actually continue to replay that last point that when we took that set off of Penn State over and over again,” recalled Dockery, one of the two team captains. “That was a huge accomplishment, and I’m pretty positive that gained us more respect as a lower seed in the tournament. Taking that set off Penn State is just like, don’t always underestimate the underdogs, because anything can happen.” Dockery plans to pursue a professional playing career, like older sister 24-year-old Tiana, who played at Kansas and just finished her third season playing overseas, having just returned from Switzerland. The teammates’ bond grew even tighter on a recent team trip to Africa to compete against opponents from Botswana and Zimbabwe, the first volleyball team from a historically black college and university to take an international tour. The trip, from May 13-May 25, was the opportunity of a lifetime for Okunade. The 11-time Mid-Eastern Athletic Conference champions made the most out of the trip, competing against opponents from Botswana and Zimbabwe, and holding clinics for local schools. For Dockery – who coincidentally also tore her ACL in high school, almost a year to the day after Okunade – it was her first time traveling outside of the U.S. She admits to having some nerves, which were quickly eased upon seeing the people and feeling the vibe. “Being able to teach the kids the sport that’s been a big part of my life ever since I was little – the sport that’s taken me places and given me opportunities; the sport my dad knows, that my sister knows – was just really special,” explained Dockery, who has three other half-siblings – Jacob Morales, 22; Aleah Miranda, 26; and Grasyn, 4. The trip, which offered the student-athletes opportunities to volunteer in areas within their current fields of study while broadening their worldview and developing their global leadership skills, was particularly life-changing for Okunade. “I’m thinking about moving to Botswana, honestly,” said Okunade, the youngest of three siblings (an older sister, Olayinka, died in 1999 of rhabdomyosarcoma at age 11). “They showed me a program about how you can become an ambassador there, and I want to go through the program and do that,” added Okunade, whose other siblings are Omotara, 26, and Olukemi, 23 and whose parents, Adegoke and Ester, own Fountain of Life Health Services, a home health business. For Dockery, who’s part Native American, the trip gave her a new worldview.